Migraine is a highly prevalent and disabling neurological disorder associated with a wide range of psychiatric comorbidities. In this manuscript, we provide an overview of the link between migraine and several comorbid psychiatric disorders, including depression, anxiety and post-traumatic stress disorder. We present data on psychiatric risk factors for migraine chronification. We discuss the evidence, theories and methods, such as brain functional imaging, to explain the pathophysiological links between migraine and psychiatric disorders. Finally, we provide an overview of the treatment considerations for treating migraine with psychiatric comorbidities. In conclusion, a review of the literature demonstrates the wide variety of psychiatric comorbidities with migraine. However, more research is needed to elucidate the neurocircuitry underlying the association between migraine and the comorbid psychiatric conditions and to determine the most effective treatment for migraine with psychiatric comorbidity. Migraine affects 12% of adults in the USA, making this condition a common concern for many patients and their doctors.1 Often overlooked is the high prevalence of psychiatric comorbidities associated with migraine, such as depression, anxiety and post-traumatic stress disorder.2–4 Migraineurs with psychiatric comorbidity have higher healthcare utilisation tendencies than migraineurs without psychiatric comorbidity.5 If left untreated, these comorbid psychiatric conditions can increase the risk of migraine chronification, the evolution of episodic migraine (EM) into chronic migraine (CM) (ie, at least 15 headache days a month, including at least 8 days/month with full-blown migraines). In addition, if left untreated, the comorbid psychiatric conditions can increase migraine-related disability, reduce quality of life and negatively impact treatment outcomes. Here, we describe the epidemiology of psychiatric comorbidities associated with migraine, and describe some screening tools for diagnosing these comorbidities. Following this, we describe recent functional neuroimaging findings and theories that might help to elucidate the connection. We then provide an overview of migraine treatment options, including pharmacological and behavioural therapies with a special emphasis on treating patients with psychiatric comorbidities. Psychiatric comorbidities are common in migraine patients (table 1). The relationship between migraines and sleep is bidirectional: on the one hand, sleep disturbances (such as, excess of, lack of, or irregular sleep) are known triggers and risk factors for migraines, and on the other hand, migraines interfere with patients’ quality of sleep.64 The neurobiological mechanism underlying this relationship is likely due to some overlapping pathophysiology and shared anatomical structures within the brain.65 In addition, depression and anxiety are comorbid with both sleep disorders and migraine. Research neuroimaging studies provide insights into the emotional component of migraine symptoms and might provide insights into the comorbidity between migraine and psychiatric disorders. Migraine studies demonstrate abnormal function, structure and connectivity of brain regions that play important roles in determining emotional responses to pain and to other sensory stimuli, and in determining general affect and mood. Greater pain-induced functional activation, and stronger functional connectivity of these regions, likely contribute to determining the emotional aspect of migraine symptoms, and could partially account for the coexistence of psychiatric disorders with migraine. 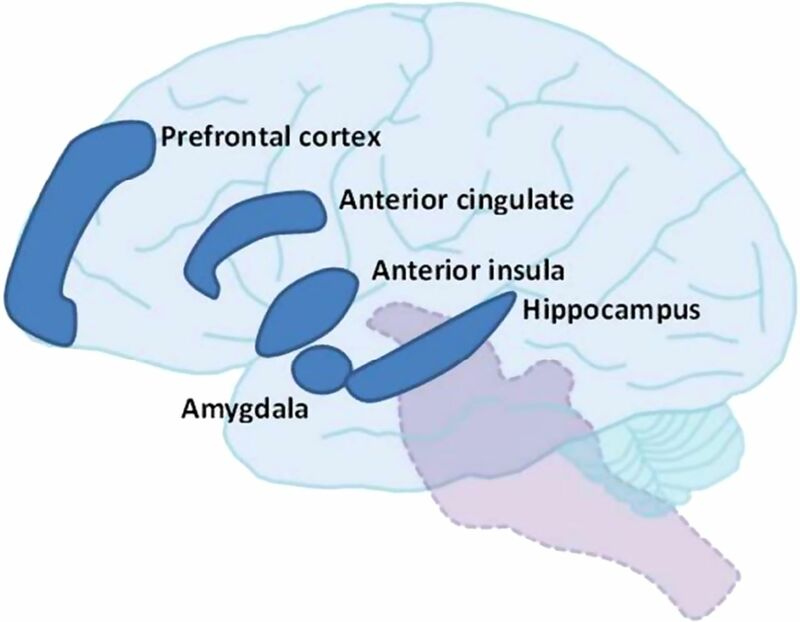 Affective-motivational brain regions that have been commonly identified as having abnormal function or structure in migraine studies include: anterior cingulate cortex, anterior insula, prefrontal cortex, hippocampus and amygdala.88–100 Figure 1 illustrates these brain regions. Affective-motivational brain regions commonly identified as having abnormal function or structure in migraine studies. Within the realm of a migraine study, atypical structure and function of these regions are usually interpreted as being associated with atypical affective-motivational processing of noxious stimuli, including the emotional reactions to migraine headache, lights, sounds and odours. This theory is supported by studies that demonstrate people with migraine tend to have greater activation of affective-motivational brain regions in response to painful stimuli and stronger functional connectivity between affective-motivational brain regions and those regions responsible for sensory-discriminative processing compared with healthy controls. For example, fMRI studies comparing pain-induced brain activation patterns in people with migraine with healthy controls, have demonstrated people with migraine tend to have greater activation in the hippocampus, prefrontal cortex and anterior cingulate cortex, regions that are involved in the emotional responses to pain.88 ,90 Resting-state functional connectivity studies have shown that compared with healthy controls, people with migraine have stronger connectivity between affective-motivational brain regions and those responsible for sensory-discriminative processing. For example, studies demonstrate that people with migraine have stronger connectivity between anterior insula with primary visual cortex, primary auditory cortex and thalamus, and between amygdala with visceroceptive insular cortex, auditory cortex, thalamus and somatosensory cortex.89 ,91 ,93 Stronger functional connectivity could predispose the person with migraine to greater emotional responses to noxious sensory stimuli during the migraine attack. However, since not all migraine studies have matched subject cohorts on measures of anxiety and depression, or excluded participants with psychiatric disorders, it is possible that anxiety and depression are over-represented within these migraine cohorts. This makes it difficult to determine if imaging findings are due to migraine, to psychiatric comorbidity, or to a combination of both. Brain imaging studies of people with psychiatric disorders demonstrate atypical structure and function of similar regions as those identified as being atypical and important for affective-motivational processing of sensory stimuli in migraine studies.101–106 Similar to people with depression and other psychiatric disorders, people with migraine have atypical function and structure of brain regions that are important for determining affective-motivational responses to sensory stimuli and for determining mood.100 These regions are key components of brain networks implicated in emotion, such as the limbic system, the salience network, and the default mode network. The emotional components of migraine symptoms and the relationships between migraine and comorbid psychiatric disorders might be partially explained by stronger functional activation and connectivity of these brain regions. However, further investigations are required to determine if the atypical imaging findings are a baseline brain trait that predisposes a person to greater emotional responses to painful sensory stimuli as well as to the development of comorbid psychiatric disorders, if they are a result of recurrent migraine attacks that then leads to the development of greater stimulus-induced emotional responses and comorbid psychiatric disease, or if the presence of psychiatric disease leads to changes in these regions that then alter a person's emotional responses to noxious sensory stimuli. Comorbid psychiatric conditions need to be considered when devising a treatment plan for the patient with migraine.21 ,111–113 However, many of the treatments listed above are evaluated in samples of patients without comorbid psychiatric illness, limiting our understanding of how these comorbidities impact outcomes of migraine treatment. The literature that does exist on the impact of psychiatric comorbidities on the effectiveness of headache treatment is mixed. Some studies have cited psychiatric comorbidities as a reason for failure of migraine treatment.114–117 Other studies have indicated that patients with comorbid psychiatric diagnoses show similar rates of improvement after treatment when compared with patients with no comorbid psychiatric diagnoses.118 To date, there is no treatment algorithm for the management of migraine in patients with psychiatric comorbidities. However, a few considerations need to be mentioned. Second, when the psychiatric comorbidity is mild, monotherapy for migraine prevention and a psychiatric comorbidity can be considered. For example, the migraine preventive propranolol may help with some forms of anxiety. However, when the treatments of the psychiatric comorbidity and migraine do not overlap or the conditions are severe, it is necessary to use separate treatments.119 Examples are discussed in table 3. Third, the treatment of migraine and the psychiatric comorbidities should be carried out in a sequential stepwise manner with close monitoring of potential side effects and treatment interactions.11 Attempts should be made to avoid migraine preventives that can potentially worsen patients’ psychiatric comorbidities. For example, the migraine preventive topiramate can affect mood.120 The data about a potential association between β-blockers and depression are controversial and limited.120 In the event that someone has a psychiatrist, it is advisable to consider discussing potential risks with the patient's psychiatrist before prescribing migraine-preventive medications. A few studies have been conducted examining how treatment of migraine may impact comorbid psychiatric disorders. A recent pilot study on the effect of onabotulinumtoxin A used for migraine prevention in patients with CM with comorbid depression and anxiety suggested an improvement in depression and anxiety symptoms measured by the Beck Depression Inventory II, Patient Health Questionnaire 9 and (GAD-7.127 However, further studies are needed. Psychiatric comorbidities have a much higher prevalence in patients with migraine than in the general population, and even more so in patients with CM than in patients with EM. There are hypotheses that could potentially explain the intricate relationships between psychiatric comorbidities but, the biological mechanisms to explain these intricate relationships are still not well understood. Of concern, psychiatric comorbidities seem to increase the risk of development of migraine chronicity, decrease the quality of life of patients with migraine, and complicate migraine management. Since psychiatric comorbidities so intricately affect migraines, their chronicity and their management, it is essential to screen patients with migraine for psychiatric comorbidities. More studies need to be conducted to explicitly address this intersection from a therapeutic point of view given the clinical, functional and cost implications.
. New insights into the comorbidity of migraine and depression. Adv Stud Med 2002;2:754.
. Posttraumatic stress disorder: the burden to the individual and to society. J Clin Psychiatry 2000;61(Suppl 5):4–12; discussion 13–14.
. DSM-5 and personality disorders: where did axis II go? J Am Acad Psychiatry Law 2014;42:141–5.
. Sociodemographic and comorbidity profiles of chronic migraine and episodic migraine sufferers. JNNP 2010;81:428–32.
. Why study the comorbidity of migraine? Neurology 1994;44(10 Suppl 7):S4–5.
. Prophylactic pharmacotherap. In: Olesen J, Tfelt-Hansen P, Welch MA, eds. The headaches. New York: Raven Press, Ltd, 1993.
. Comorbidity of migraine and major affective disorders. Neurology 1994;44(10 Suppl 7):S17–22.
. Psychological assessment of the recurrent headache sufferer. In: Tollison C, Kunkel R, eds. Headache: diagnosis and treatment. Baltimore, MD: Williams and Wilkins, 1993:39–49.
. Development and validation of a perceived stress questionnaire recommended as a follow-up indicator in occupational medicine. Encephale 1997;23:184–93. Competing interests RL reports grants and personal fees from Alder, personal fees from Allergan, personal fees from CoLucid, grants and personal fees from Electrocore, personal fees and other from eNeura, personal fees from Ethicon, personal fees from Merck, grants and personal fees from Novartis, personal fees from Labrys, personal fees from Autonomic Technologies, personal fees from Boston Scientific, personal fees from Bristol Myers Squibb, personal fees from Dr Reddys, personal fees from Eli Lilly, personal fees from Endo Pharmaceuticals, personal fees from Informa, grants from Migraine Research Fund, grants from National Headache Foundation, grants from NIH, personal fees from Teva, personal fees from Vedanta, outside the submitted work. TJS reports personal fees from Allergan, personal fees from Zogenix, personal fees from Supernus, all outside the submitted work.